Press each pillar to get the key on the top left of the door. Tap the white box on the right wall. Note the sequence of numbers at the top and left of the box. Press each box according to the number pattern. 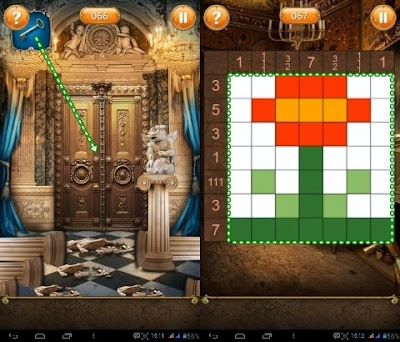 Press each piece of the puzzle to compose correctly. Press the right part of the clock to see the instructions. 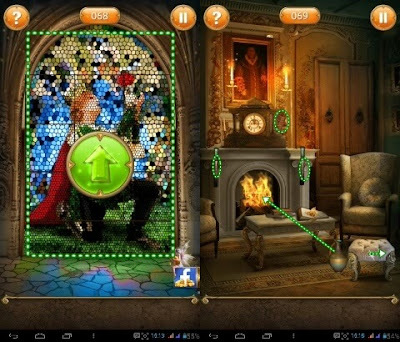 Press the lever on the left and right of the fireplace in sequence: Left, right, left, left, right, and left. Slide the seat to the right then place the bottle into the fireplace to extinguish the fire and use the key to open the door. Press the chessboard on the table. Press each chess box like the letter "L" to move the chess horse to the door.